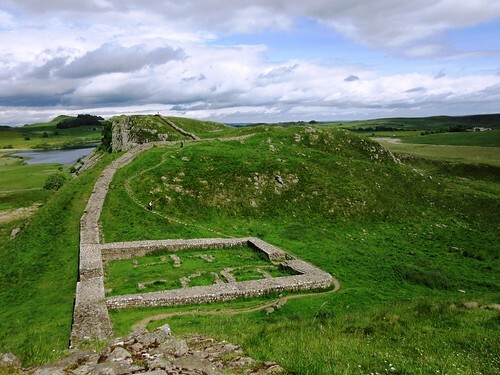 Hadrian’s Wall, its observation towers and guard-posts, the roads and townships that served it, form the most remarkable monument in Britain to those energetic, organised and life-loving invaders, the Romans. They wrenched our history so forcefully out of its former courses; and yet it’s the tiny details of their quotidian lives that fascinate us most. How incredibly angry the tile-maker of Vindolanda must have been when that stupid pig walked all over the nice new clay flooring he’d left out to dry in the sun. A surviving tile from the spoiled batch, on display in Vindolanda’s museum just south of the Wall, carries the prints of the pig’s incurving toes, as sharp today as the hour they were dinted two thousand years ago. 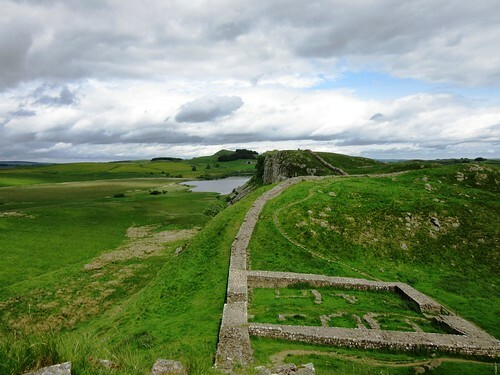 And here alongside are the hobnailed shoes and thong sandals of this Roman fort’s inhabitants, their nose-picks and knives and scribe-written birthday invitations; while outside lies the foundations of the town they lived and loved in, its houses, temples, wells and paved streets. 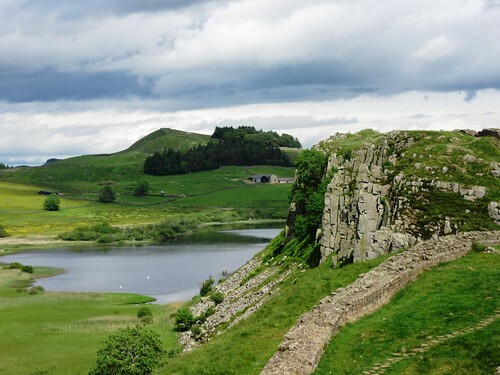 Walking the rushy meadows a mile or so to the south, I looked up at the thin line of the Wall as it rode the rollercoaster crags of the Whin Sill, the volcanic rampart that strides across the neck of Northumberland. 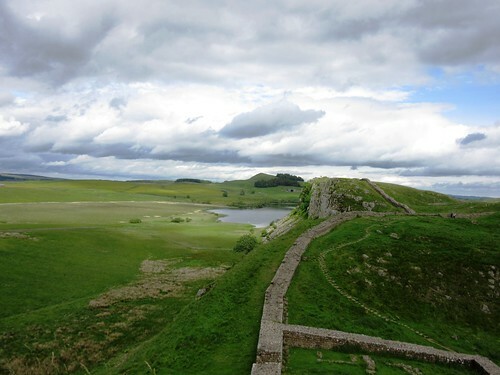 A magnificent bull, muscled like a body-builder, lion-coloured and sporting a leonine mane, watched me cross the broad grassy ditch or vallum and turn east along the Wall. The stepped path swooped me up the crests and down into hollows of the dolerite sill, passing the sites of the milecastles and turrets where conscripts from the Low Countries paced and shivered and looked out into the debatable lands to the north from where the wild Picts might come screaming at any moment. 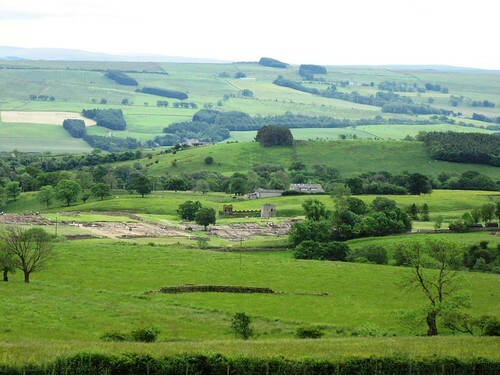 As I stared out from the Wall to the looming black line of Wark Forest, the blue humps of the Cheviot Hills beyond, it was all too easy to imagine those young men sulkily clutching their cloaks around them and wishing they were down in Vindolanda where the latrines ran with clean water and the stew came hot to the table. The old house and barns of Hotbank Farm lay huddled on the slope of Hotbank Crags, their walls much patched with Roman stones. Here I left Hadrian’s Wall and headed across the vallum and down flowery meadow slopes, with Vindolanda spread below me in the evening sunlight. Road – signposted from B6318 at Once Brewed (north of A69, between Haydon Bridge and Haltwhistle at Bardon Mill). Walk (8 miles, moderate – many short, steep slopes – OS Explorer OL53. NB: detailed directions, online maps, more walks at christophersomerville.co.uk): From Vindolanda car park, left along road; in 100m, left through gate, down track; in 400m, right (766660) on path (stiles, yellow arrows/YAs). NB After passing barn at Kit’s Shield (764659), negotiate tree blocking path! Skirt Layside (760659, YAs); on to road (756658). Left, then right along lane (‘Cranberry Brow’) for 1⅓ miles to road (735655). Right (fingerpost) on drive to Hill Top; on to road (730659). Right to cross B6318 (729663, stile, ‘Shield on the Wall’). Path along field wall, then diagonally left across Roman Vallum ditch to Hadrian’s Wall (727669). Right along National Trail for 3 miles to Hotbank Farm (771680). Leave National Trail here; right down farm drive to B6318. Right along grass verge for 400m; left (770674, stile, ‘Vindolanda’) across field, aiming to cross stile on left of High Shield house (769672, YA). Left to stile (YA); down fields with fence on left. In 2nd field, fence trends away left, but keep a beeline ahead to stile and road at bottom (772665). Right to Vindolanda car park. 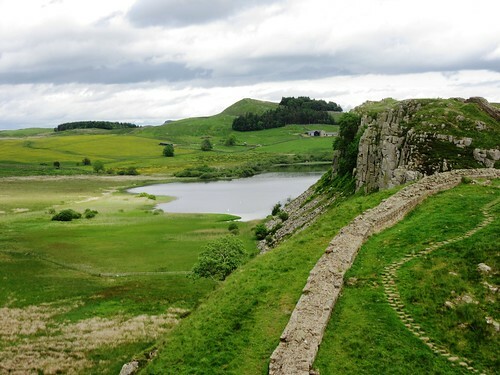 Conditions: Short, steep ups and downs on Hadrian’s Wall. Bulls, cows, calves may be in fields. 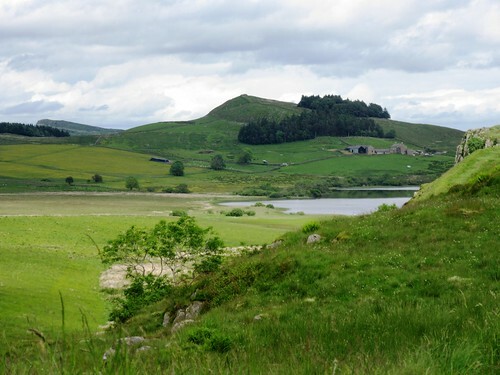 Information: Northumberland National Park Centre, Once Brewed (on B6318 next to Twice Brewed Inn) – 01434-344396. Open weekends only in winter.